This is one of the pieces in the Verdant Works Exhibition ‘The Arctic Whaling Year’, Autumn 2018. Whalers were as superstitious as any other sailors and had many rituals which they observed. They also amended rituals for the circumstances they found themselves in. A good example of this is the crossing the line ceremony. This is traditionally an initiation for sailors crossing the equator for the first time. 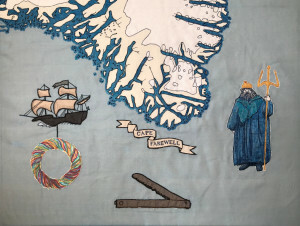 But in the case of whalers it could be performed when they crossed the Arctic Circle on the way up to the early whaling grounds around Spitsbergen and as locations of whaling changed it could be performed on May Day or when passing Cape Farewell at the southern tip of Greenland on the way to the Davis Straits. Neptune and his wife would board the ship (looking suspiciously like members of the crew dressed up) and, using an oversized jagged joke razor, the green-hands (first-timers) would be ‘shaved’ after a mixture of soot and grease was applied to their faces. This was then followed by music, dancing and the consumption of alcohol. Most captains tolerated the carousing that followed as a relatively controlled way for the sailors to let off steam. In some places when the ship left port the wives and sweethearts would give ribbons to their sailors as keepsakes. On May Day these ribbons would be woven round an iron hoop to form a garland, often suspended under a model of a whale ship, and hoisted onto the rigging for luck. This was not brought down until the ship returned to port where boys competed to be first up the rigging to reach the garland. At Hull Maritime museum there is an original joke razor from a whaleship. I have used my drawing of it here. In several of the museum’s paintings of Arctic whaleships you can see the garlands hanging between the masts. My dad was in the Fleet Air Arm and I have his crossing the line certificate, signed by Neptune. I used the image of the sailing ship from it for the ship above the garland. When I first crossed the Arctic Circle, Neptune came aboard and tipped some icy water down my back as my initiation. Under the beard he looked somewhat like the Assistant to the Cruise Director. I have used my photo of him as a basis for the illustration here. The map is based on the one in the Norwegian polar explorer Nansen’s book on his first crossing of Greenland.